Event will start at Automobilia a private car garage and restoration center. It houses one of Southern California's most prestigious, vintage and classic private car collections. 2790 East Del Amo Blvd. Our Poker Run will head out from Automobilia rolling through the streets of Long Beach past our Honoring Our Fallen Memorial Wall and down the shoreline to Long Beach Marina. The afternoon car show will feature- Food Trucks, Vendors, Entertainment, Military Vehicles, and a special American Heroes Tribute Banner presentation at 2pm. Classic Car Cruise is schedule to "Roll" into the Long Beach Marina at 11 a.m. 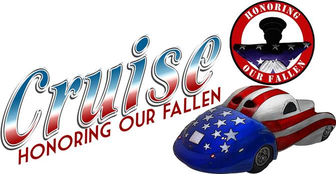 Car Show is FREE to the public to view and will be held from 11 a.m. to 3 p.m.
Cruise Honoring Our Fallen is a unique effort to involve the entire community for a day of fun for the whole family to give back to the families who have suffered the loss of a precious loved one who paid the ultimate price for our freedom. Proceeds directly help Honoring Our Fallen support families of the heroes who have lost their life defending our freedom. While there is nothing we can do to bring back their loved ones, we can do a lot to bring confort to the families here at home by showing them there is a community of support right on their doorstep.